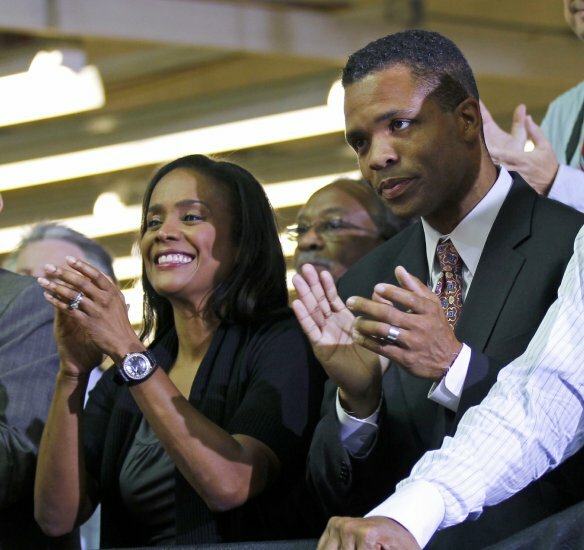 The other shoe in the stunning fall of one of Chicago’s most powerful and glamorous couples dropped yesterday, when Rep. Jesse Jackson Jr.’s wife, Sandi Jackson, resigned from the Chicago City Council, just weeks after her husband resigned from Congress. Rep. Jackson resigned his seat just two weeks after his resounding victory in the 2nd District, which he has represented since 1995. He won 63 percent of the vote despite disappearing from public view back in June, and had been treated at a facility in Arizona and at the Mayo Clinic in Minnesota for bipolar disorder and gastrointestinal issues. In addition to his health problems, Jackson also faces an FBI investigation into alleged misuse of campaign funds. According to reports, he is in negotiations over a plea deal that could result in jail time. The FBI is probing Jackson’s alleged use of campaign funds to decorate his home and to buy a $40,000 Rolex watch for a female friend. There were reports that the investigation had expanded to include his wife. Investigators reportedly are scrutinizing whether she was aware of or complicit in her husband’s alleged misuse of campaign money. But Sandi Jackson made no reference to any of the FBI matters in her statement. Sandi Jackson’s name had been circulating in Chicago as a candidate to take over her husband’s seat, but last month she said she wasn’t interested. Two years ago, Sandi Jackson talked about her husband’s affair with a blond Washington hostess, saying she was sticking by him. She said he had told her about the affair two years earlier. Before being elected to the City Council, Jackson, who also owned a political consulting firm, served as deputy director of training for the Democratic National Committee, director of scheduling operations for Rev. Jesse Jackson, vice president of Congressional and external affairs for the Export-Import Bank of the United States (appointed by Bill Clinton), director of VIP relations for the Presidential Inaugural Committee, national outreach coordinator for the Clinton/Gore 96 Campaign.